Part 1) Computer measurement of pulse before and after exercise. We can bring multiple machines, test the children in small groups, get them to exercise under the supervision of their teachers and then take their pulse again. Part 2) We have a small anatomical model of internal organs for the children to take apart and rebuild and we talk through what different parts do. Description: We can give talks at any level on the structure of the brain and the way in which it works. For Lower KS2 we have previously used jelly brains to demonstrate this. We bring previously set jelly in anatomically correct brain moulds (flavour of your choice – lime and orange work particularly well!). 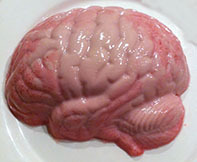 The children are invited to eat parts of the 'brain' while we describe the function of that part of the brain and the role it plays in your body. After this we can provide life size models and ask the children to colour-in pictures of the brain as a record of their activity. Description: As above but we would bring ECGs (electrocardiograms) for Upper KS2, to measure the heartbeat and compare to the pulse. We use heart models to discuss the structure of the heart and play games with soft balls to demonstrate the difference between heart muscle and the muscles of your limbs and body muscles. Description: Same as for Upper KS2 'How your heart works', but with more detail on the circulatory system. Description: As above for KS3 but we can now include both the circulatory system and the electrical conduction around the heart. Description: As above for KS4, we can for A2 students also look at how the ECG was developed and ask them to review defective ECG traces. Description: The use of the technique of Spirometry to understand the breathing cycle and volumes of the lung. We may also be able to bring lungs in to schools or use here in the department to demonstrate inflation. Description: As above for KS3 using Spirometry we can look at mimicking asthma as well as calculating the volumes found in the lung. We can demonstrate how these are used to diagnose diseases such as cancer and chronic obstructive pulmonary disease (COPD). Description: We can perform an experiments to examine your nervous system. This involves testing your reaction times – are you as fast out of the blocks as Usain Bolt, could you be a fighter pilot or compete with Bruce Lee? This can be a stand alone with an introductory talk, 30 minutes of practical tests and a quick round up at the end. We can provide all the hardware required. Description: For this age group we can again perform the same reaction time tests, as for KS3, on computer software and hardware that we provide. Alternatively or additionally we can test the speed of peripheral nerves by giving small controlled (and largely painless) electrical shocks to monitor thumb twitches. Students can be introduced to the peripheral motor neurons that control their muscles and the general principle of action potential conduction and the function of the synapse (neuromuscular junction in this case). They can be asked how fast they think neurons and nerves work. We will then perform experiments and see how they match their expectations. For more advance groups we can follow this with a discussion of the use of such techniques in a clinical setting.